PITTSBURGH -- Mario Lemieux, an expert in the art of the comeback, can't wait for Sidney Crosby to make his second long-awaited return of the season for the Pittsburgh Penguins. Crosby, out for the last three months with concussion-like symptoms after also sitting out the Penguins' first 20 games, is practicing again and plans to return in the near future. The earliest he could play is Sunday against Boston. "I'm going to try to push myself and see how it feels," Crosby said Wednesday, a day after he was cleared for full-contact practice for the first time since Dec. 7. Crosby also missed the second half of last season and the Stanley Cup Playoffs with a concussion that was diagnosed after he was hit hard in successive games Jan. 1 and Jan. 5, 2011. At age 24, he is nearly the same age Lemieux was when the Penguins' co-owner and Hall of Famer first began experiencing the major health issues that troubled him the rest of his career. "It's never fun to be on the sidelines, especially with Sid's injury" said Lemieux. "It's a little different than back surgery or hip surgery or anything else out there. You have to be patient. But I think he's getting better, he's getting close to being back on the ice. And it's going to be exciting when he gets back." "It's never fun to be on the sidelines, especially with Sid's injury. It's a little different than back surgery or hip surgery or anything else out there. You have to be patient. But I think he's getting better, he's getting close to being back on the ice. And it's going to be exciting when he gets back." Lemieux sat out the two-thirds of the 1990-91 season after having back surgery but returned to lead the Penguins to the Stanley Cup. He later experienced more back problems, cancer, a hip injury and a heart-related issue during a brilliant career that was interrupted again for one entire season (1994-95) by health issues and included a 3.5-year retirement before he unexpectedly returned again in 2000. Because he was forced to sit out so much time in his prime, Lemieux understands exactly what Crosby is going through. Only 15 months ago, Crosby was in the midst of a career-best season with a Lemieux-like 66 points in 41 games, only to suffer the concussion. "I know he's anxious to get back. It's been a difficult three months for him off the ice, but I think he's turning the corner now, he's looking a lot better," Lemieux said. "And I'm anxious to see him back." 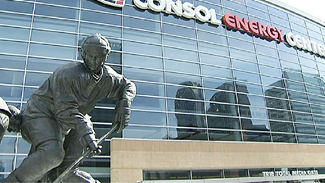 Lemieux, who rarely discusses team issues, answered questions about Crosby following a ceremony for the unveiling of a Lemieux outside Consol Energy Center. Crosby and his teammates attended. This will be Crosby's second much-anticipated comeback in only a few months. He made a spectacular return with a two-goal, two-assist game against the Islanders on Nov. 21, but played in only seven more games until the concussion-like symptoms returned; they went away only a few days ago. Coach Dan Bylsma still hasn't settled on potential linemates for Crosby. Previously, Crosby played most often with Chris Kunitz and Pascal Dupuis, but Kunitz has settled in with 30-goal scorer James Neal on star center Evgeni Malkin's high-scoring line. Among the options are reuniting Kunitz, Crosby and Dupuis, which will allow Steve Sullivan to return to Malkin's line, where Sullivan began the season, or to play Sullivan on Crosby's line. "I think it's natural to have thought long before (Tuesday) about where Sidney would play and what line he would play on," Bylsma said. "There's certainly a lot of thought been given to that -- had conversations with Sidney about that, as well. When we have a time where he's going to be getting back, we'll have a better idea. We'll let you see what that might be when he does get back and possibly get back." Crosby and Malkin occasionally play together, often late in games when the Penguins are desperate for offense. Lemieux expects them to be together on a power play that once was a weakness but has become a strength. The Penguins went into the game Wednesday against the Maple Leafs (7:30 p.m., NBCSN, TSN) ranked fifth in the League with a 20.1-percent conversion rate. "You have two of the best players in the world, the problem is they both like to play the same half wall, so they're going to have to flip a coin," Lemieux said. "Sid's pretty good down low, as well, and from what I've been seeing with Malkin and the power play this year, he moves around pretty well. He ends up on top a lot of the times and behind the net, so I'm sure they can figure it out and interchange and have a little bit more movement than in the past." As Bylsma said, it's a problem any NHL coach would love to have. "The thought of putting Sidney Crosby in the mix there -- having the best player in the world in that mix, as well -- is certainly a good thing to ponder," Bylsma said.